Cristobal “The Nightmare” Arreola was born on the 5th March 1981, in East Los Angeles, California USA, and is a first generation Mexican-American boxer, best known for being a three time contender for the World Boxing Council Heavyweight title, whose professional career began in 2003. He stands at six foot three inches tall, has a reach of seventy six inches, and is fighting weight is two hundred and forty pounds. 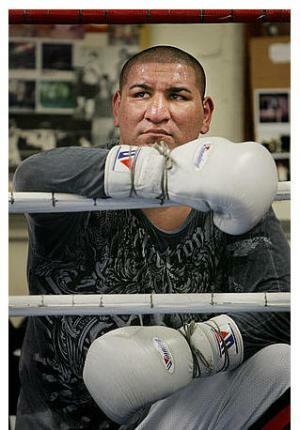 An accomplished and well regarded boxer, how rich is Chris Arreola? As of early 2017, authoritative sources estimate that he has a current net worth of over $3 million dollars, earned over his sporting career which now spans nearly 50 fights. Chris began training at the age of eight, following in the footsteps of his father, Augustin. As a child, he met the man widely considered to be the greatest Mexican boxer of all time, Julio César Chávez, who no doubt played a large part in inspiring Arreola to become the contender we know today. Arreola trained under Hector Rodríguez at the Resurrection Boxing Gym in Los Angeles and, as a competitor on the amateur circuit, he participated in approximately two hundred bouts, until he quit boxing at the age of sixteen, burned out on the sport after eight years. He would return aged twenty, reportedly after being disappointed with the quality of boxing he saw on television, to win the National Golden Gloves Heavyweight Championship within three months of becoming involved in the sport again. Arreola would have competed again for the Golden Gloves two years later, in 2003, but arrived for registration just after the deadline. He instead turned professional, going on to win his pro debut bout by technical knockout. He holds an impressive record to accompany his amassed fortune, with thirty six out of a total forty four fights won, thirty one by knock out, with five losses, one draw, and two no contests. He has been ranked within the top ten boxers by all four of the sport’s major governing bodies. His first shot at the WBC Heavyweight title came in 2009, against Vitali Klitschko, at the LA Staples Centre. Though pleased to be fighting on his home turf, he didn’t make it to round eleven, with the referee stepping in to stop proceedings and to award Klitschko a win by technical knockout. In 2013, with the title vacant Arreola fought Bermane Stiverne, but lost again to knockout. Still eager to become the first Mexican to obtain the Heavyweight Championship title, his third attempt, in 2016, saw him matched with six foot seven Deontay Wilder. Wilder’s purse for the fight was a reported $1.4 million, compared to Arreola’s relatively small $150,000. Wilder took the fight in the eighth round when Chris retired. The boxer has known some controversy during his career. Arreola has, at times, been criticised for a seeming reluctance to commit fully to his training, and for his fluctuating weight between fights. Also, in January of 2016, the result of his December 2015 victory over Travis Kauffman was changed to no contest, as Arreola tested positive for marijuana. As of January 2017, he is the reigning WBC Fecombox (Mexican) Heavyweight Champion. His present trainer is Henry Ramirez. In his personal life, Arreola currently resides in Escondido, California, and is married to Erin with whom he has two children.